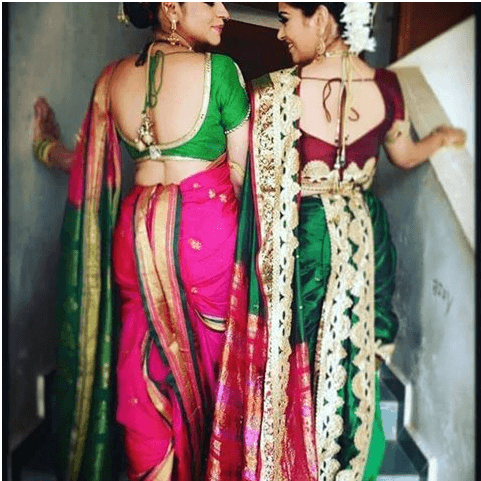 The Nauvari style of saree draping is special, not only because it provides a silhouette that is completely different from any style seen in any other part of India, but because the saree itself is about 8 to 9 meters long, as compared to the 5 and a half meter length in ordinary ones. Thus, one can see the lovely cascades of folds and the gorgeous usage of pallu with the show of the border at the back. What few know however is that the Nauvari can be worn in different ways, owing much to the fact that within Maharashtra, it is worn by various castes and communities as per their cultural or occupational requirement. The Brahmin style is quite different from the Lavani style and so on. Well, here is one that is easy on draping effort with few steps to follow and the kind that will keep the pallu looking elegant and well under control. It will make it easy for you to walk in this style of drape. The Nauvari is also called the ‘akhnada vastra’ or the garment that is complete in itself. While women from Pune and Satara wear it at an ankle length, the women in the more rural interiors wear it high up to the knees. For all three drapes, one has to simply wear a pair of leggings instead of the underskirt and a matching blouse. Take one end of the saree and bring it to the right side and tie a tight knot. Now take the rest of the length for making the typical pallu. The pallu could fall right up to the knee from your left shoulder. The pallu should be pleated after it comes round your back and be pinned on the right shoulder later. Now come the pleats in front. All you have to do is make as many pleats as you can with the huge length in front of you. After you reach the last pleat you will see enough fabric is left on the left side-so bring it over the rest of the pleats to make a bolster kind of collection. This has to be pinned up safely at the center. Now take the central pleat from the ones in the front and taking its width in your hands take it from in between the legs to the back. Here you must take the width of the saree and make some pleats and tuck it right at the center so that the two borders show clearly. Moving back to the front, you have to take the cascading drop of the pleats on your right and pick up it’s lowermost portion and bring it to the left-hand side waist and pin it up there. For this too, the nine-yard saree is what you need. You are of course wearing your pair of leggings. Open the saree and tie a tight knot by bringing the saree on to the right-hand side of the waist. Tie the knot on the extreme right. Now take the saree around the body and bring it onto the front to make the pallu. The pallu has to be made with pleating the other end and pinning on the shoulder as you would do with any other style of saree draping. After this come the front pleats. Make as many pleats as you can with each pleat having a width of at least three inches. Bring the leftover length on the left to roll over the pleats. Pin up the pleats. Now comes the back to the front switch. The drape that is at the back has to be brought from between the legs to the front where you have made the pleats, and pinned up over there. Now comes from front to back switch. Here you have to take the center pleat and then take it between the legs and make pleats with its width at the back before tucking in. It would be a good idea to pin up the borders of the saree near the ankles so as to keep them well aligned. You can keep the pallu short so it can be lifted width-wise over the back in the typical Lavani dance style. Take the saree by the upper border and tie a knot with the longer length lying to your right and the shorter length on your left. Now take the shorter length and simply take it between your legs to the back and then make pleats with its entire width and then tuck it in the back neatly. Come back to the front and make pleats with the rest of the saree leaving enough for the pallu. Tuck in the pleats. Now take the saree around yourself and back to the front to form the pallu. Make pleats for the pallu and pin it up on the shoulder. The most wonderful part of this drape is that this drape gives you the complete feel of the kasta saree drape but without the back tuck being exposed. That is why some who are wary of wearing it in the typical Brahmani or Lavani style could opt for this. Take a look at the picture for the manner in which you could be doing up your makeup and jewelry. Once you have this style of hair do, crescent shaped black bindi and the nose pin, you’re much closer to the real look, particularly of the ‘peshwai’ style drape.